uuid : a9b64bdc-b1ab-4236-9caf-b519aabdc9cf templates_id: 119539 templates_uuid: "5c66d6ed-9e45-47bc-82fa-15f3dc908c81" title: "Poor Performance Outcome Letter - Warning or No action" display_name: "Poor performance outcome letter - warning or no action" meta_keywords: "Warning letter to employee for poor performance" description: "
Managing poor performance is simple if you follow proper procedure. Use this poor performance outcome letter to confirm that an employee has been given a warning (first or final) as a result of poor performance or that no further action will be taken. Inform an employee of the outcome of a poor performance evaluation with this letter. 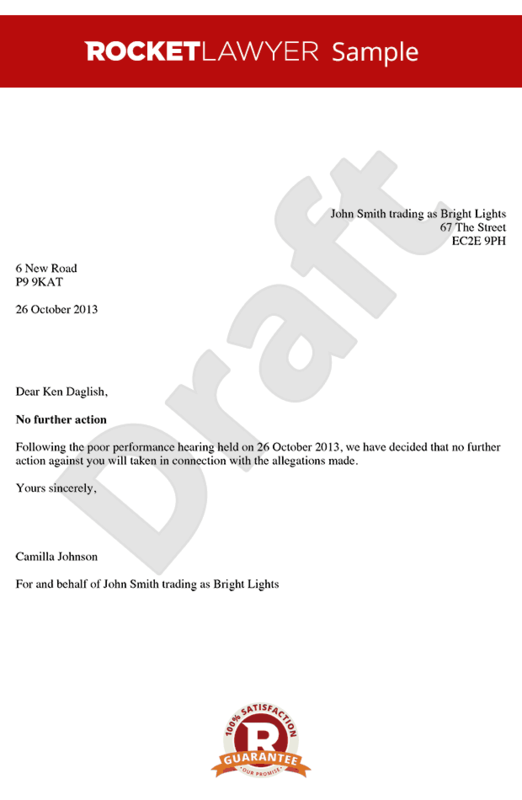 What is a disciplinary outcome letter for poor performance ? Every employer who has held a disciplinary hearing on grounds of an employee\302\222s poor performance should provide the employee with a disciplinary outcome letter for poor performance. This letter essentially sets out any decisions made during a disciplinary meeting and outlines the reasoning. It will either clarify that no further disciplinary action will be taken (eg. if it is decided that there was a valid reason for the poor performance) - or else it will confirm a first or final warning. If a warning is given, the letter should state what the employee is expected to do in order to remedy their poor performance, along with a timescale for improvement. Why do I need a disciplinary outcome letter for poor performance? Employers must communicate any decisions arising from a disciplinary meeting to the employee in writing (in accordance with s. 17 of the Acas Code of Practice on Discipline and Grievance). Failure to do so can result in an uplift of 25% in any compensation awarded by an employment tribunal (eg. if the employee successfully brings a case for unfair dismissal). Aside from the requirement under the Acas Code, ensuring that disciplinary decisions are properly documented reduces the risk of confusion or disputes further down the line. How long does a warning last for? Warnings issued for poor performance should specify how long they are in effect; if an employee fails to heed the initial warning while it is still in effect, this can lead to a final warning. An initial warning period normally lasts 6 or 12 months but there are no specific rules governing warning periods - but they should be reasonable (ie. they should not last indefinitely). Can employees appeal the outcome of a disciplinary hearing? Yes - employees always have a right to appeal disciplinary decisions made on the grounds of poor performance. Employers must communicate this right of appeal in the disciplinary outcome letter, as this is required under the Acas Code of Practice.
" created_timestamp: "2018-10-08 04:36:45.0" modified_timestamp: "2018-10-08 04:36:45.0" active: true created_by: 236 modified_by: 236 dcm_id: 259 url_slug: "Letter-to-an-employee-confirming-no-dismissal-after-poor-performance-process" meta_description: "Create a poor performance outcome letter with Rocket Lawyer\'s guidance. Use this to confirm that an employee has been given a warning as a result of poor performance or that no further action will be taken. " time_to_complete: "10 minutes" role1: "Employer" role2: "Employee"
Every employer who has held a disciplinary hearing on grounds of an employees poor performance should provide the employee with a disciplinary outcome letter for poor performance. This letter essentially sets out any decisions made during a disciplinary meeting and outlines the reasoning. It will either clarify that no further disciplinary action will be taken (eg. if it is decided that there was a valid reason for the poor performance) - or else it will confirm a first or final warning. If a warning is given, the letter should state what the employee is expected to do in order to remedy their poor performance, along with a timescale for improvement. More than just a Poor performance outcome letter - warning or no action template, our step-by-step interview and guidance makes it easy to create your document. Easily create online, download, print and sign your free Poor performance outcome letter - warning or no action in minutes. This document is also sometimes called: Warning letter to employee for poor performance.